I had just returned after nearly three months of intense trek through the tribal landscape of remote and thick forests of Arunachal Pradesh. Armed with the minutest detail of its ecosystem and insights into its community-managed forests and water, I was ready to write a thesis. Just then the big idea of Down To Earth happened. For the uninitiated, it was fascinating to watch a potential thesis taking shape as an attractive feature story in the debut issue of Down To Earth, May 1, 1992. “Tell the story about what you have seen and understood, and say it in a language with drama that will appeal to all,” said Anil Agarwal who had incubated the big idea. While this became my personal story of transmutation into a journalist that I had never planned to be, this was also a rare instance where a popular magazine was launched mainstreaming a story from the fringe. Down to Earth changed our lives as we clocked ourselves from the infinite timeline of research to tight time frame of a story deadline. For some of us who were making forays into popular writing for the first time, it was a new world and lingo. Bevy of editors tutored us on story line, story angle, and casting stories in a frame clichéd as the inverted pyramid. We learnt how to think visually while writing to pack a punch in the message. As the assembly line of writing, editing, and designing rolled, madness and excitement set in. News meetings raised heat and dust over what makes a story. Will I ever forget the most trying moments of finding convincing news pegs every morning at 10 to get space in the pages of Down To Earth? Life had changed in many ways. Few issues later, I and Anjani Khanna, our science reporter, accompanied Anil and Sunita Narain to Rio de Janeiro for the Earth Summit. We had a handle to influence and inform the climate negotiations. But it was also planned that an entire issue of Down To Earth would be devoted to the Summit. After a fortnight of intense climate politics, as I slipped into a fatigued coma on reaching Delhi, the phone exploded within couple of hours with the shrill summon from Anil that we must write and close the issue within a day. I woke up to the reality of a fortnightly lifestyle, but also the excitement of writing what no one else was capturing in the Indian media on the first-ever climate summit. The new prism, through which stories on development politics around environment had to be written, helped us to go beyond the obvious. When drought hit Rajasthan in 1992 and stories of economic misery splashed across the media, I was investigating in the darkness of night near Udaipur finding out how villagers in distress were stealing wood from the forests to survive. No one had got that yet—how drought also speeds up deforestation as communities, barred from legitimate access to their own forests, have to plunder to get survival food and alternative livelihood that sets off a viscous spiral. The story was always not what was most apparent. This was clear when I was set off to investigate sandalwood smuggling epitomised by the dreaded smuggler Veerappan that otherwise was a routine crime story in the media. But this crime story exposed how illegal activity was an expression of people’s hostility towards a tree that the State had made a state property. This was leading to clandenstine destruction. If this tree could be sustainably grown and harvested by the community, it could have wiped out poverty in the sandalwood belt. This investigation sent ripples that led to some loosening of the State’s stranglehold on sandalwood protection and trade. But I will never forget the goose bumps I got traversing the remote villages of Nullur, Vachati and others in the forests, tracking sandalwood smugglers to hear their story. How scary it was to travel through the M M Hills to Veerappan’s village and his deserted house. Rumour was rife that Veerappan would strike again as that day was the anniversary of his deadly ambush the previous year. It was eerie to talk to the villagers, the partners in his crime, who already knew I was around. Down To Earth was always about making connection that others had not made. When the communal riots broke out in early 1990s, we trooped out to riothit areas. I had to report from ground zero to convey why some neighbourhoods remained safe, while others were burnt. I got amazing responses from distraught people who explained this as a form of “community fencing” built over time. Only Down To Earth would value and report this critical connection that can prevent riots. Environmental reporting is also adventurous. While reporting on child labour in the carpet making belt of Bhadoi and Mirzapur, I was gheraoed by goons as soon as I opened the shutters of my camera to click the children huddled in rooms weaving carpets. I faced a similar situtation when I tried reaching limestone mines that had devastated the ecology near Renuka Lake in Himachal Pradesh. Or imagine facing an irate crowd near Ashok Vihar in Delhi, where informal settlements were fighting with middle class neighbourhoods over open defecation and basic rights. Or that daring stunt perched behind Rustam Vania’s wobbly two-wheeler on the hills of Uttarkashi still shaking from the aftershocks of the earthquake of 1991 to investigate why buildings kill, earthquakes don’t. Down To Earth did change the established news values with an attitude. 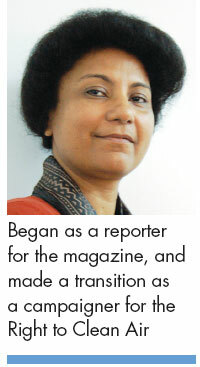 After several years of reporting, Down To Earth catalysed yet another metamorphosis. It was one summer afternoon in 1995 when Anil called us to his office, very angry after standing in a long queue to get a pollution under control certificate for his car. He blasted this as “tailpipery” and “imbecilic” and asked, “Is only vehicle maintenance at the heart of the problem of air pollution?” He asked us to do a cover story on why vehicles in India pollute so much. That set us off on an incredible journey to know the nuts and bolts of polluting two-stroke engines, diesel emissions, and dirty fuels. This story unearthed the politics of inaction of the industry and the government. Down To Earth did an exposé on “Smog Inc” based on this investigation and put the transport and environment ministers, and the largest producer of two-stroke two-wheelers, Rahul Bajaj, on cover page, saying, “Nailed for slow murder”. 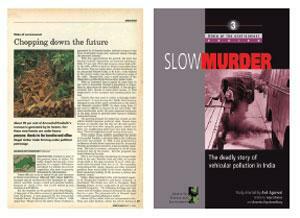 But the larger spin off of this investigation was the book “Slow Murder: The Deadly Story of Vehicular Pollution in India” that catalysed the Right To Clean Air campaign in CSE. Down To Earth remained the most powerful platform to push the message out all through our fight for clean air. This was the time I was reborn as a campaigner.